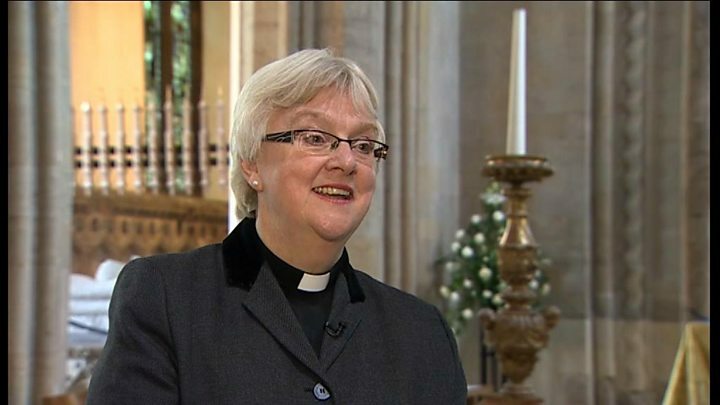 The new Bishop of Llandaff wants the diocese to "go forward" following a selection process where the Church in Wales was accused of being homophobic. It denies Dr Jeffrey John's claim that he said he was rejected as Dr Barry Morgan's successor because he was gay. It is understood Dr John received the most electoral college votes but not the two-thirds needed by Church rules. The Bench of Bishops appointed the Rt Rev June Osborne after the initial process failed to select a candidate. Bishop Osborne - a friend of Dr John, who is the Dean of St Albans - was consecrated as 72nd Bishop of Llandaff at Brecon Cathedral on Saturday. "I'm sure we will go forward really confidently under my leadership," she told BBC Radio Wales. "I wasn't part of the early process and simply I don't know what went on. "The process is very clear and was followed meticulously. I'm confident - and it has been scrutinised - that the process was followed carefully and constitutionally. "I realise Jeffrey John won't be the only one disappointed to not be the Bishop of Llandaff and I hold Jeffrey in very high esteem, he is a good friend. "For myself, I can only say discernment has happened. The sense that this is God's call to me is very vivid to me. "I am the Bishop of Llandaff and the diocese will want to gather around that fact." "Being ordained a bishop into the Church in Wales is such an immense privilege and to be the Bishop of Llandaff even more so," she added. Her comments come as Dr John claims the contents of emails between two bishops show they were against his selection because of his sexuality. One, dated 8 February and published in the Church Times last week, read: "My instinct is that JJ's stance on the matter of same-gender relationships and his own situation might be un­­welcome to many in the Diocese... It would probably do the perception of the Bench, at home and elsewhere, no particular good either." Another sent on 17 February stated: "I will be meeting with my electors in Cardiff, probably on Mon­day evening, and expressing my an­xi­eties." In an interview with BBC Radio Cymru's Bwrw Golwg programme, Dr John said the emails "show how deceiving and hypocritical the whole process has been from start to finish". In response, a spokesman for the Church in Wales said: "We understand that the private correspondence of the Church in Wales' bishops concerning the process to elect a Bishop of Llandaff has again been put into the public domain by others. "We are satisfied that the entire process of electing and then appointing the Bishop of Llandaff was carried out properly and fairly and will not be commenting further." 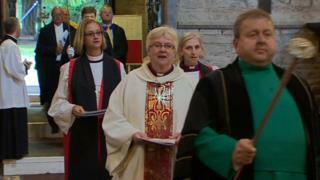 Bishop Osborne is the Church in Wales' second female bishop appointment after Canon Joanna Penberthy was consecrated as Bishop of St Davids in January. She left her post of Dean of Salisbury after 13 years, where she became the first woman to become a dean at a medieval cathedral. The diocese of Llandaff serves most of Cardiff, the south Wales valleys and Vale of Glamorgan. Bishop Osborne will be enthroned at Llandaff Cathedral on 22 July.